The UN Security Council’s resolutions have not succeeded to stop North Korea’s nuclear program. All over the world, refugees have increased, reaching 65 million, of which half are children. The Doha round has stalled, resulting in the proliferation of bilateral and regional Free Trade Agreements, less efficient than a multilateral agreement. Obviously, our international governance order needs mending, despite a decent track record. There has not been any worldwide war for the past 70 years, and the post-war liberal international economic system brought about unprecedented prosperity, raising the income level of many developing countries, including China and India. But the international community has outgrown its present governance system, partly due to its very success. It is now facing new challenges: the international community has become more interdependent, new risks are global in scale, and with progress in transportation and communication technologies, risks could spread almost instantaneously. As countries develop, it is natural that they aspire to play a part in rule-making and have their views reflected in the global governance order. But the number of UN member countries has increased from 51 to 193 since foundation, and this increase brings new challenges. Democracy is a widely accepted domestic governance system in many countries. In the international setting as well, a democratic governance order is called for. But what would be a desirable democratic order when countries differ in their security, economic, political and other capabilities, and so many different countries need to come together? In the face of pressing global threats, what is the best way to achieve a right balance between inclusion and efficiency? An important element to consider is the cost of maintaining good international governance, and who should bear this cost. 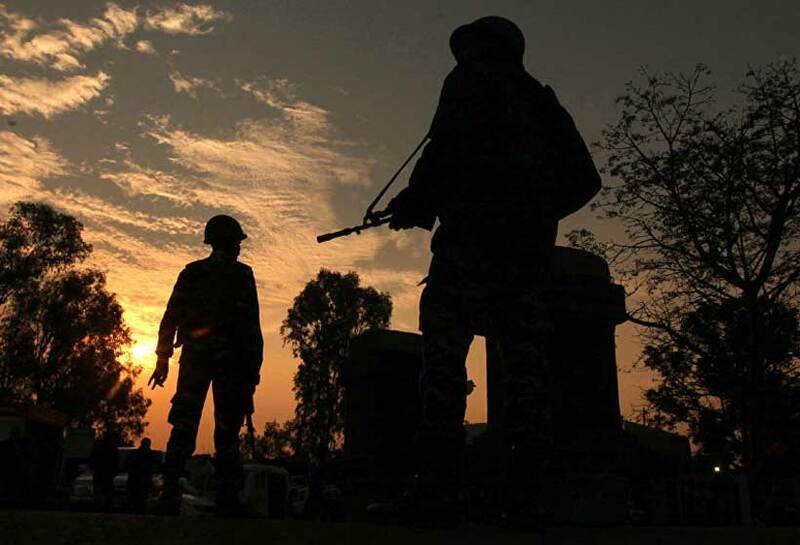 The UN’s Peacekeeping Operations need to be financed and staffed. The same is true with the World Trade Organization. Good international governance is an international public good which, by definition, tolerates free-riders. If all countries free-ride, the system cannot survive. Worse still, costs have risen as risks have increased. For over 70 years after the Second World War, the USA bore the largest burden, with contributions from other developed countries. Now, circumstances have changed greatly, and the USA has relatively declined. With this power-shift, the responsibility for cost-bearing should be shared more broadly by countries aspiring to a greater voice in the international decision making. Fortunately, real world examples demonstrate that this has been taking place. For example, the Paris Climate Agreement stipulated that responsibility to reduce greenhouse gas emissions – and thus cost sharing – applies to developing countries on the principle of equal but differentiated responsibilities. 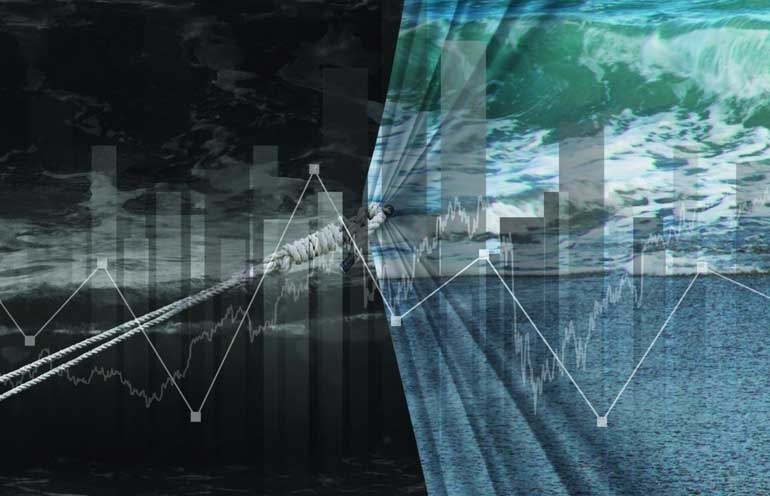 Beyond the question of cost sharing, a good international governance system needs to be efficient as well, because time could be a vital factor in dealing with risks. This means, the system needs to be both representative and functional. One potential model would combine a broad structure where all nations participate, and smaller structures allowing certain countries to play a larger role in decision making, but with greater responsibility for cost bearing. Various structures already play this second role. The G20 is a good example. The G20, at the summit level, met for the first time in 2008, following the global financial crisis, to respond and build a resilient international community. Participating countries together represent about 2/3 of the world’s population, 90% of its GDP, and 80% of trade. The 12 summit meetings since then have helped leaders understand each other‘s　thinking, given guidance on global problems and agreed on important action plans, some of them with target dates. The Hamburg Summit in 2017 covered a wide variety of issues, including trade and investment, excess capacities in the iron and steel industry, global financial systems, climate change and Africa. Now, major decisions pertaining to world problems must be endorsed by the G20 to be viable. The G20 is an improvement over the G7 in terms of inclusiveness. However, work is still needed to create a sense of joint responsibility and, perhaps, develop agreed principles for action, so that the G20 can be more effective and action-oriented. This was the case with the G7, which agreed and acted on the decommissioning of the former Soviet nuclear submarines after the demise of the Soviet Union. Another exemplary vehicle is the World Economic Forum. This is a forum for political, business, academic and other thought leaders from around the world. It functions as an incubator for creative thoughts and initiatives for actions to orient governments and business. For example, an initiative for water was created at Davos by the leadership of some international companies, and influenced governments and business to act on clean water supply. Partnership between governments and business will be more important in the years to come, because risks will become more complex, with more serious implications on our interconnected world. Governments, many of which are under serious financial constraints, cannot deal with those singlehandedly. Partnership with local governments and citizens’ groups should also be strengthened for the same reasons. The objectives of an international governance system are to achieve peace, stability, and prosperity. The most important underlying factor for this is the willingness of the nations and peoples to honor governance rules. This piece forms part of the Global Challenges Foundation’s report, Global Governance for Global Citizens, published in September 2017. Oleg Shakirov, expert of the Center for strategic research and Russian International Affairs Council expert, tells PICREADI about digital diplomacy and how social media affects international relations. Today’s complex security environment requires the United States to use all of its instruments of power to maintain its status in the world, as well as to protect its own interests and the interests of its allies. Traditionally, the instruments of power are separated into Diplomacy, Intelligence, Military, Economic, Financial, Information, and Law Enforcement, abbreviated as DIMEFIL in nearly every United States military Professional Military Education (PME) school. In almost all cases, the Military is considered the strongest of those instruments of power while Diplomacy is too often give short shrift. 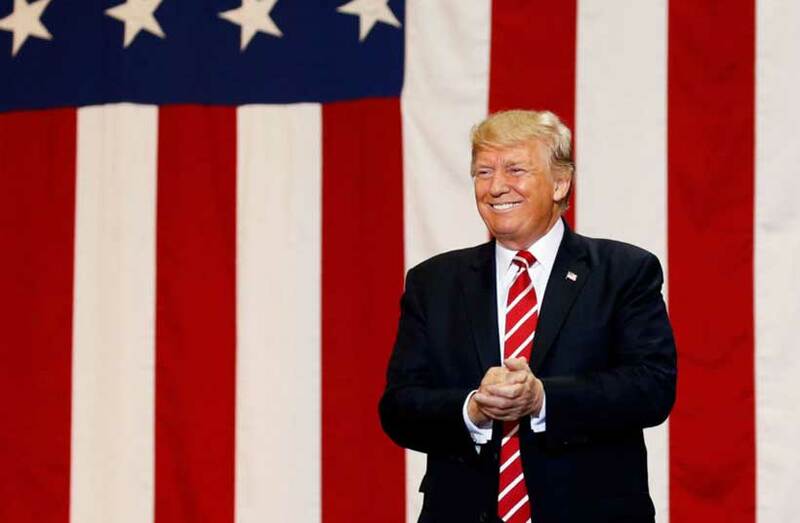 However, the continued use of Military Diplomacy offers a hybrid instrument of power to help connect with allies across regions while advancing the interests of the United States. This article will look at military diplomacy as a potential hybrid instrument of national power and how the Office of Security Cooperation-Iraq (OSC-I), under the U.S. Embassy Baghdad and U.S. Central Command utilized military diplomacy to reconnect Iraq with its neighbors in the Middle East. The current United States National Security Strategy (December 2017) lays out the importance of continuing to engage with our partners and potential allies. It states, “Diplomacy catalyzes the political, economic, and societal connections that create America’s enduring alignments and that build positive networks of relationships with partners.” The Diplomacy and Statecraft section goes on to identify three different types of diplomacy: Competitive Diplomacy, Tools of Economic Diplomacy and Information Statecraft. Similarly, the Military instrument of national power is mentioned throughout the 2017 National Security Strategy. From protecting the American people to defeating Jihadist terrorists, the military instrument of power is weaved throughout the document. However, there is a gap within the 2017 National Security Strategy. The article attempts to draws a cleaner line between the use of the United States military and its diplomatic efforts. The use of military diplomacy is an important tool not addressed in the National Security Strategy and one that can help bridge this gap. Amy Ebitz, in her paper from the Brookings Institute titled, “The Use of Military Diplomacy in Great Power Competition: Lessons Learned from the Marshall Plan,” states Military diplomacy can also be referred to as “defense diplomacy,” soft power,” “military public diplomacy,” and “strategic communication. Her terms of either defense diplomacy or military public diplomacy align well with the above definition of military diplomacy. However, use of soft power and strategic communications do not. Soft Power, as originally coined by Joseph Nye, refers to, “the ability of a country to persuade others to do what it wants without force or coercion.” This often is accomplished by projecting soft power through companies, foundations, universities, churches, and other institutions of civil society. I would argue soft power falls more in the information instrument of national power and not within the military instrument. Using this definition as a base, military diplomacy does not fit well into these categories of strategic communications. For the purpose of this paper, Erik Pajtinka’s definition, “A set of activities carried out mainly by the representatives of the defense department, as well as other state institutions, aimed at pursuing the forcing policy interests of the state in the field of security and defense policy, and whose actions are based on the use of negotiations and other diplomatic interests,” will be used to guide this article. There are three main parts of Pajtinka’s definition of military diplomacy. First, “The activities are carried out mainly by the representatives of the defense department.” This is a critical difference between traditional diplomacy. Rather than traditional diplomats in the lead, different representatives from the Department of Defense are leading these efforts. Next, the activities are, “Aimed at pursuing the foreign policy interests of the state in the field of security and defense policy.” As with most actions at the strategic level, the activities of military diplomacy must focus on the foreign policy interests of the government. However, a key difference is these foreign policy interests are in the fields of security and defense policy. The focus on these two traditionally military related fields helps clarify where traditional diplomacy ends and military diplomacy begins. Finally, those implementing military diplomacy conduct their activities, “Based on the use of negotiations and other diplomatic interests.” Unlike other traditional military activities to work with partner nations, military diplomacy leads through negotiations and other diplomatic interests before entering back into traditional military endeavors. This will be explained further in the example of the Office of Security Cooperation-Baghdad’s efforts. The Department of Defense has a variety of tools available to promote military diplomacy. First and foremost are the Combatant Commanders themselves. These four-star General Officers are responsible for specified geographic regions across the globe. Within each combatant command, the leadership interacts with numerous countries across their footprint. For example, U.S. Central Command (CENTCOM) has an area of responsibility of more than 4 million square miles, populated by more than 550 million people from 22 ethnic groups speaking over 18 languages. Equally important, CENTCOM partners with 20 nations from Kazakhstan to Egypt. Each United States combatant command has similar footprints, getting to interact with nearly every nation on the globe in some capacity. The Commander of a combatant command interacts with all of the nations within their footprint. When visiting one of the countries in their area of operations, they coordinate with both the U.S. Ambassador responsible for the country team and the security cooperation office within the host nation. The result is a high ranking military diplomat, synchronized with the leading Department of State person in country, and bringing a massive capability to work with partner nation security forces. Combatant commands have a large tool kit from which to pull from to help move U.S. interests forward. This includes all branches of the military (Army, Navy, Air Force, Marines) as well as the ability to serve as a coordinator between nations who may not have the friendliest of histories. Each branch of the service under the combatant commands carries with it leadership, units and expertise within their respective regions. The result is a massive amount of capability to conduct military diplomacy. As Iraq achieved success against Islamic State (IS) forces in 2017, there was a palpable shift from the use of military power to military diplomacy. After decades of isolation brought by previous Iraqi actions, United Nations sanctions and violence following the 2003 invasion of Iraq, the Government of Iraq only had one neighbor to turn to for help within the region: Iran. Sharing a major border of nearly 875 miles, these two countries have always been and will always be neighbors. As a result, there is a massive amount of legal and illegal trade crossing their borders. Additionally, the commonality of the Shia religion in both countries connects them on another level. The two have been, and will be tied together due to their proximity and shared backgrounds. However, Iraq needed other partners in their region besides Iraq. 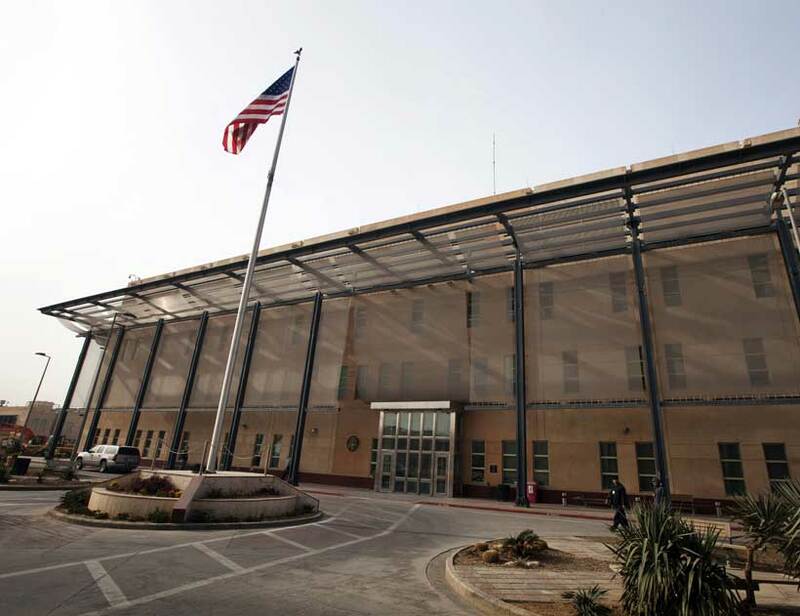 As a result, the Office of Security Cooperation-Iraq(OSC-I), located within the U.S. Embassy in Baghdad, focused on using military diplomacy to help Iraq break out of its isolation. Traditionally, Security Cooperation offices focus on the sale of U.S. military equipment to a host nation. OSC-I works for both for the U.S. Chief of Mission in Iraq, and for U.S. CENTCOM. This placed it in a perfect position to facilitate military diplomacy. In mid-2017, OSC-I had two main lines of effort. The first was traditional security assistance: the sale of equipment and parts to the Iraqi government. The second, defense institution building, focused on security sector reform and the building of the necessary institutions to sustain their security forces. Eventually, the priority of effort shifted to the important work of ensuring the sustainability of defense institutions. However, as the ISIS fight within Iraq concluded, senior leadership within both Department of State and Defense realized Iraq needed local partners to break out of its isolation. As a result, OSC-I developed a third line of effort: Regional Engagements (see Figure 1). 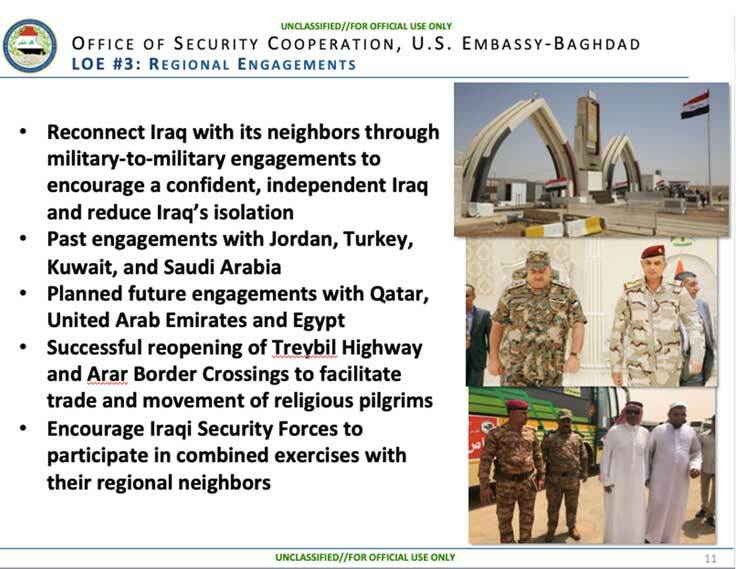 Figure 1: Office of Security Cooperation-Iraq, Line of Effort #3: Regional Engagements. From OSC-I Command Brief, 28 May 2018. The regional engagement effort became a classic case of implementing military diplomacy to help a partner nation, Iraq. Knowing Iraq was isolated with only Iran as a local partner, the use of military diplomacy became a critical component of reconnecting Iraq with their other neighbors more friendly to the United States. The goal was to reconnect Iraq with its neighbors through military-to-military engagements to encourage a confident, independent Iraq and reduce Iraq’s isolation. As a result, military diplomacy became a major effort between the United States and Iraq. OSC-I, working with the Department of State and CENTCOM, reached out to surrounding neighbors and their militaries to increase military-to-military cooperation. This was the first step of military diplomacy. The initial plan was to engage at the Chief of Defense level between neighbors. With direct access to the Iraqi Chief of Defense, OSC-I was perfectly positioned to use military diplomacy. First and foremost, this effort was coordinated through and approved by both the U.S. Ambassador and the CENTCOM Commander. The coordination between the two leads for both the diplomacy and military instruments of national power already had a solid relationship OSC-I was able to benefit from. Getting the process started was not as easy as a phone call. The military diplomacy process began by coordinating invitations through the Department of State and the Iraqi’s Ministry of Foreign Affairs. Additionally, CENTCOM was able to leverage its “power to convene” through its Commander at the time, General Joseph Votel. He and his staff served as the coordination link between the U.S. Embassy, OSC-I and the Iraqi Chief of Defense. Once coordinated, formal invitations were sent from the Iraqi Ministry of Foreign Affairs to their corresponding Ministries of Foreign Affairs in both Jordan and Saudi Arabia. Once the invitations were received, and confirmed by the Security Cooperation offices in both Jordan and Saudi Arabia, CENTCOM contacted both Chiefs of Defense to emphasize the importance of the upcoming meeting, and added the CENTCOM Commander would serve as the host. The first result of this military diplomacy effort was a tri-lateral engagement in July 2017. The Chiefs of Defense of both Jordan and Saudi Arabia met with the Iraqi Chief of Defense in Baghdad. This initial meeting set the groundwork for future bi-lateral meetings between the Chiefs of Defense, and their respective staffs to improve communications and coordination between the neighboring countries. For OSC-I, this successful tri-lateral engagement demonstrated the power of military diplomacy when properly coordinated and supported by both Department of State and Department of Defense. Another meeting rapidly followed, this time a bi-lateral between the Iraqi and Jordanian Chiefs of Defense. Discussion focused on the reopening of the Treybil border crossing between Iraq and Jordan. Closed during the Iraq War in 2003, the Treybil Highway served as a main trading route between Baghdad and Amman. A similar process occurred: coordination between embassies, the security cooperation offices and CENTCOM. Invitations were coordinated through the U.S. Embassy then the Iraqi Ministry of Foreign Affairs. The invitation went to the Jordanian Ministry of Foreign Affairs, and once the Security Cooperation office confirmed receipt, CENTCOM connected with the Jordanian Ministry of Defense to offer their support for the conference. A meeting soon followed. As a result of this meeting between the Jordanian and Iraqi Chiefs of Defense, staff working groups were established. Their work resulted in the Treybil border crossing reopened in August 2017, serving as a main trade route between the two nations and taking a major step towards normalizing relations. Next, the Saudi Arabian and Iraqi Chiefs of Defense met in a bi-lateral engagement hosted by CENTCOM and coordinated by the Office of Security Cooperation-Iraq. The result of this military diplomacy effort was the reopening of the Arar border crossing for the first time in 27 years. This key border crossing was closed in 1990 after the countries cut ties following Saddam Hussein’s invasion of Kuwait. The reopening assisted Iraqi religious pilgrims headed to Mecca during the Haj season. The governor of Anbar province, Sohaib al-Rawi said, “This is a great start for further future cooperation between Iraq and Saudi Arabia.” Again, coordination occurred between both U.S. embassies in Iraq and Saudi Arabia, between the Security Cooperation offices overseen by CENTCOM made this important military diplomacy success story a reality. After the September 2017 Kurdish referendum, tensions between Iraq and Turkey were extremely high. Turkey moved additional forces to the Iraqi border in response to the Kurdish vote for independence. Conflicts flared up between Iraqi troops and Kurdish fighters. The need for military diplomacy was needed more than ever. Again, through military diplomacy, a tri-lateral discussion between the Iraq, Turkey and the United States was set up. Senior leaders in attendance included European Commander, General Curtis Scaparrotti, Turkish Chief of Defense General Hulusi Akar, Iraqi Chief of Defense, General Othman al-Ghanimi and U.S. Central Command Commander General Joseph Votel. The meeting occurred in Ankara, Turkey on December 14, 2017. This was again coordinated across both U.S. embassies, and in this case, two Combatant Commands to make this example of military diplomacy occur. The result of this meeting was the reopening of communications between the Turkish and Iraqi Chiefs of Defense. This was both extremely important and timely as Iraqi and Turkish troops faced off against one another on their border. The two Chiefs of Defense, shepherded by their U.S. combatant command counterparts, were able to meet face-to-face and reestablish a civil dialogue. The result was an increase in positive communications between the two military Chiefs and a reduction in tensions between the two neighboring militaries. With a taste of success, the Iraqi Chief of Defense then asked through the Office of Security Cooperation-Iraq to meet with his Kuwaiti counterpart, a meeting that had not happened between the two countries since the invasion of Kuwait in 1990. Again, coordination between the Iraq and Kuwait embassies started the process. Invitations followed and the meeting was set up. The meeting between the Kuwaiti Defense Minister and the Iraqi Chief of Defense occurred on January 23, 2018. U.S. Central Command Commander, General Votel hosted the historic meeting, helping to reopen the lines of communication between these two former enemies. The result was an agreement for both militaries to continue to work together and begin developing longer-term security cooperation arrangements, an important step to normalizing relationships between two former enemies. This and the other examples demonstrate what can be accomplished by military diplomacy when coordinated properly. Key to these military diplomacy successes was ensuring the Department of State Chief of Mission was tied into all discussions and approved of these efforts. In Iraq, there were weekly video teleconferences between the CENTCOM Commander and the U.S. Ambassador where current issues were discussed. Prior to any visit to Iraq, the CENTCOM Commander coordinated with the Ambassador to better, understand the priorities of the Department of State, and ensure CENTCOM was on the same message as the Chief of Mission. Combatant Commands also have the ability to host regional ambassador conferences, such as the one hosted in Qatar by CENTCOM on October 19, 2018. The conference included chiefs of defense from the Gulf Cooperation Council for the Arabian States of the Gulf Region Countries: Kuwait, Bahrain, Oman, Qatar, Saudi Arabia ad United Arab Emirates, as well as Jordan and Egypt. The respective U.S. Ambassadors from each country attended and the U.S. CENTCOM forward headquarters in Qatar was a perfect spot to host the meeting. These conferences are another great example of military diplomacy in action. The examples above highlight the capabilities of using military diplomacy to further the interests of a country, in these cases the United States. Based on the previous definition of military diplomacy and the actions of the Office of Security Cooperation-Iraq, this article recommends four principles of Military Diplomacy. First, the Chief of Mission/U.S. Ambassador/Chief Diplomat is in the lead. Within a host nation, it is the Chief of Mission responsible for all U.S. actions. Coordination through the Embassy is a necessity and must be paramount for any military diplomacy effort to be successful. Efforts at military diplomacy without this coordination at the highest levels will not only result in failure, but also sour the critical relationship between State and Defense elements on the ground. Second, military diplomacy requires the support of the military. While this may sound like an obvious principle, military diplomacy requires elements of the Department of Defense to be involved, and to have something to offer. As mentioned earlier, Defense elements have a large toolkit to tap into. From traditional security cooperation efforts to hosting military to military engagements, military diplomacy requires the military. Militaries throughout the world have common experiences and shared languages. They are most adept at working with fellow militaries. Third, any military diplomacy efforts must work through the host nation process. In the case of Iraq, invitations to bring in senior ranking military members from neighboring countries required an invitation from the Ministry of Foreign Affairs. It was the same for when the Iraqi Chief of Defense was invited to other nations: the inviting nation would send an invitation through its Ministry of Foreign Affairs to the Iraqi MFA. These efforts took time, and sometimes resulted in frustration on the American side as invitations were lost, or caught up in bureaucracy. That being said, the U.S. State and military members were able to keep tabs on the status of the invitations and query to the status. Fourth and finally, set small goals. Sometimes just having the two senior leaders meet is an accomplishment in itself. Many involved in military diplomacy expected rapid results from all the coordination efforts. However, this often is not the case. Goals are not often met in the first or second meeting of these senior leaders. However, as demonstrated above, sometimes just having those two senior military leaders meet results in positive press, increased dialogue and the thawing of long cold relationships. When properly coordinated with the Chief of Mission, military diplomacy is an effective instrument of national power. The combatant commands have the leadership, the staff, and resources to enforce their “power to convene” utilizing military diplomacy. Bringing key military leadership from different nations together is one of the important components of military diplomacy. This is not limited to the United States. 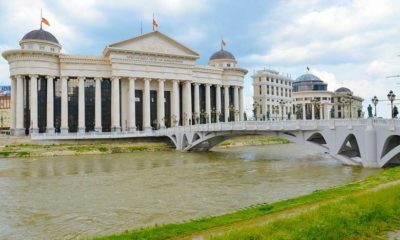 Recent tensions between North Macedonia and Greece were reduced by military diplomacy between the two nations. Most militaries have the capacity, with the support from their diplomatic branches, to successful utilize military diplomacy. More studies and research needs to look at the advantages and disadvantages of utilizing military diplomacy to help the United States achieve its stated policy goals, especially as we move back into an era of great power competition. The use of military diplomacy as a hybrid instrument of national power for the United States has provided tangible achievements in achieving foreign policy goals in the past. It must continue to do so in the future.